Parkview Dental is pleased to offer Brooks Clear Braces to correct misaligned and crooked teeth. Clear Braces are a clear alternative to conventional braces! Conventional orthodontic methods straighten your teeth using appliances and metal wire braces — and both have a reputation for being uncomfortable and unattractive. 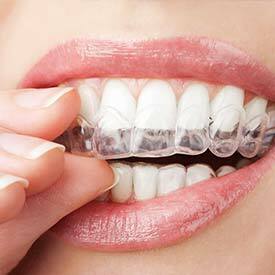 Our clear braces system uses virtually invisible brackets to move your teeth into alignment! Too much space in between the teeth can often be treated using clear braces. The spacing between teeth not only looks unattractive but can lead to concerns with the gum tissue such as periodontal pockets that can accumulate plaque and an increased risk of periodontal disease. Crossbite means that the top and bottom jaws are not aligned correctly. This can lead to abnormal wear on the teeth in the form of chipping, and cracks and periodontal problems including gum disease and bone loss. Again, clear braces is an option for crossbite, depending on your situation. Dr. Struan Vaughan and Dr. Earl Pierson provide clear braces treatment for both adults and teens. If you would like to learn more about Brooks Clear Braces, book your consultation appointment today!